CAMBODIA’S stock exchange will require listings in riel but will initially allow dual currency settlements, according to the Securities and Exchange Commission of Cambodia. “The issuing of securities shall be completed in riel and the quotation of securities in the [Cambodia Securities Exchange] shall be conducted in riel,” it said in a statement issued late last week. Settlements between buyers and sellers, however, will be allowed in both dollars and riel during the first three years of the bourse’s operation, it said. Government policy is to promote usage of the domestic currency in order to facilitate economic development, said SECC Director General Ming Bankosal. The dual options for settlements reflected the widespread use of the dollar, he said. “We will use the riel, but we also recognise [there is interest in] widely using US dollars in the Cambodian securities markets,” he said yesterday. The Cambodian economy is currently highly dollarised. 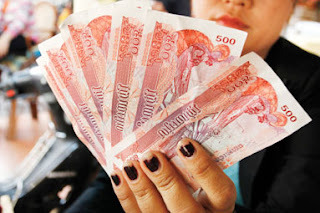 The National Bank of Cambodia has estimated the greenback accounts for more than 90 percent of currency in circulation, but has also stated it is committed to dedollarisation. Private sector officials said yesterday they were supportive of the decision. ACLEDA Bank CEO and President In Channy said yesterday that initially allowing bourse settlement in either dollars or riel would invite more participation in the exchange, which is due to launch this July. Banks currently more deposits than outstanding loans, meaning there was excess liquidity available which could be invested in securities, he said. “The stock exchange does allow small investors the great opportunity of owning a portion of … a large corporation,” he said. Leopard Capital Managing Partner Scott Lewis said most countries – including neighbouring Laos – successfully used local currencies for listings. “The government has a clear policy to encourage use of the riel and I think it’s appropriate to list the stocks in riel,” he said yesterday. Although there could be concerns over currency risk, the government does keep the riel in a fairly tight band against the United States dollar, he said. He also hoped companies would continue to be allowed to disclose financial results and complete accounting in dollars. Leopard has two interests in the Cambodian exchange – it has a few companies in its portfolio that may list, and could also pursue opportunities to buy shares in some of the first companies to list. Scott Lewis also stressed that it was important that companies were ready to float and the regulatory framework was in place for the exchange to succeed.